If you want your WooCommerce store to succeed, you’ll need to design it with the needs of your specific customers in mind. For instance, shops that regularly sell items in large quantities may require something beyond a traditional layout. These stores can benefit from making the ordering process quicker and more efficient. Fortunately, this can easily be achieved by setting up a WooCommerce bulk order form. This feature will enable your customers to buy everything they need on one page, and add it all to their cart with a single click. In this guide, we’ll explain how WooCommerce bulk order forms work and discuss what kinds of e-commerce stores they’re most suited to. Then we’ll walk you through how to set up and customize one with the WooCommerce Product Table plugin. Let’s get to work! Create a WooCommerce bulk order form today! Most WooCommerce stores are set up so that customers must visit each product’s individual page to buy it. This works well for shops where visitors are likely to purchase only one or two items per visit. However, what if you’re running the type of shop where customers tend to buy many products at once, in bulk? Forcing them to navigate to every product page will only slow them down. This leads to frustration and increases the risk that they won’t complete the bulk purchase. Customers can see all your products at once (or the ones you’ve selected to display). They’ll have the important information about each item right at their fingertips. Most importantly, they can pick everything they want to buy on the form, and add their entire order to the cart simultaneously in bulk. It’s the perfect way to allow bulk buying in WooCommerce. A WooCommerce bulk order form can be a smart addition to your site. It streamlines the buying process, improving the user experience at the same time. As a side benefit, it also promotes all your products, and encourages visitors to buy more items. 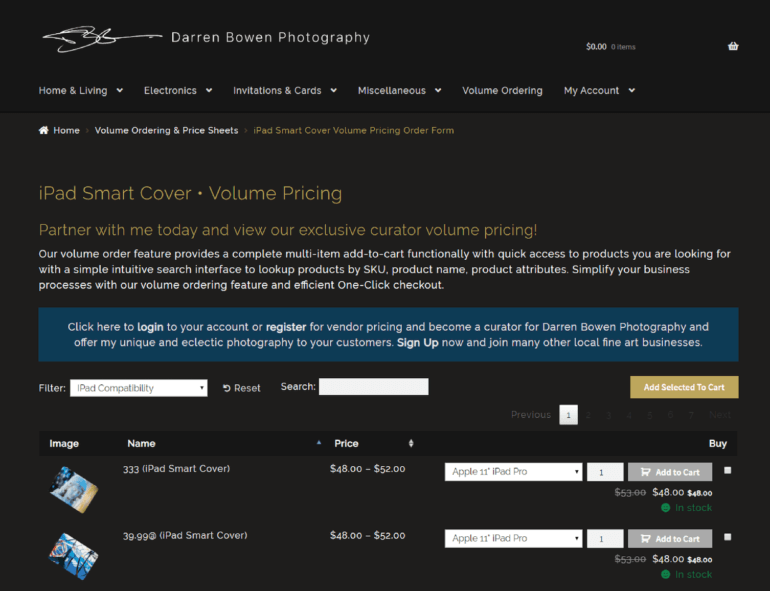 Darren Bowen is a photographer who sells his photographs online at Darren Bowen Photography. On the website, customers can also buy a range of mugs and iPad smart covers all printed with Darren’s images. Buying the mugs and iPad smart covers in bulk is easy because of the two WooCommerce bulk order forms powered by our WooCommerce Product Table plugin. It’s an easy to understand order process. The customer chooses the right quantities on the bulk order form, then uses the “add to cart” function. Once everything’s in the cart, the customer can check their order before proceeding to pay. From there, it’s a fast and simple one-click single-page checkout. 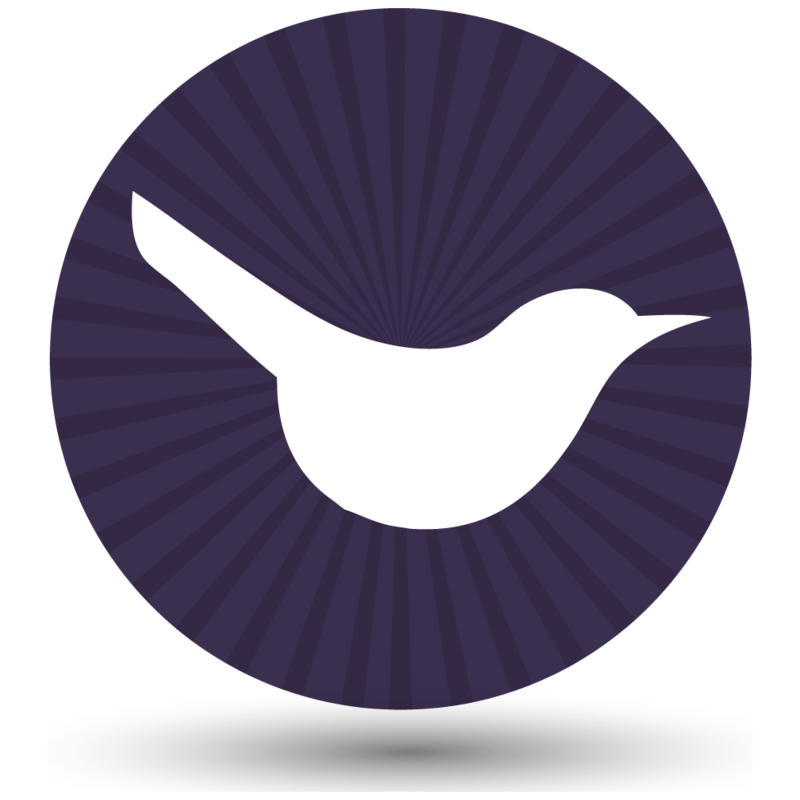 Carry on reading to find out how you can add your own WooCommerce bulk order form. Of course, not every site needs a bulk order form. How do you decide if this feature is right for your WooCommerce store? The short answer is that a bulk WooCommerce order form comes in handy for any shop where customers tend to make multiple purchases in the same order. The more likely your visitors are to buy in bulk, the more beneficial this type of order form can be. Let’s look at a few examples of e-commerce sites that will find a WooCommerce bulk order form invaluable. If you’re running a WooCommerce wholesale store then a bulk order form plugin is a must-have. Your customers are likely to know exactly what they’re looking for, and to buy dozens or hundreds of items at once. Requiring them to browse through separate product pages to choose their quantities and variations is hardly the optimal solution. With a WooCommerce bulk order form, on the other hand, you can enable buyers to make selections quickly. This is a smart way to encourage them to keep coming back. Further reading: Read our ultimate guide to WooCommerce wholesale plugins. Of course, some stores regularly sell items in bulk to individual customers. Office supply shops and similar sites are a perfect example. Customers will often want to purchase everything they need for their office in one convenient order. You need to make this bulk buying process easy for them. The same applies to any store where the products offered are fairly simple and self-explanatory. Rather than listing out each type of printer paper on its own page, you can offer all the options on a one-page bulk WooCommerce order form. The same goes for catering businesses, and some types of restaurants. Customers ordering food online will appreciate the option to select everything they want on a single page. 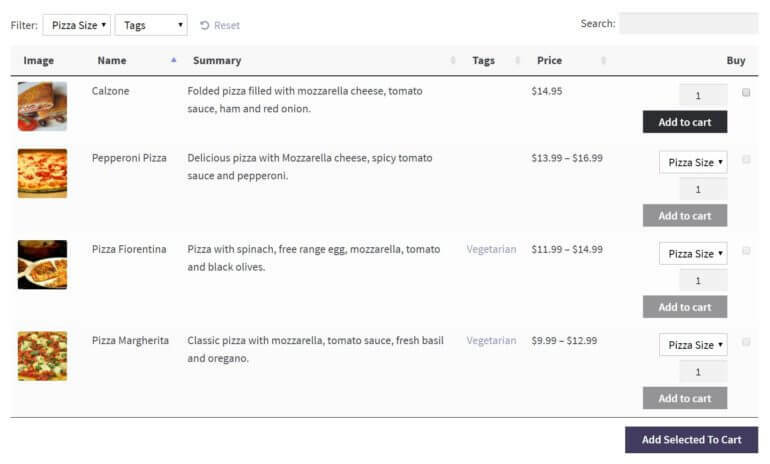 Further reading: How to create a WooCommerce restaurant ordering system. At this point, you probably know whether you’d like a WooCommerce bulk order form plugin for your online store. All that’s left is to locate the best tool for the job. This bulk order form plugin enables you to add a table of products to your WordPress site, and customize it fully. You can provide customers with the most important information about each product, enable them to sort and search for what they want, and let them make purchases right from the table. 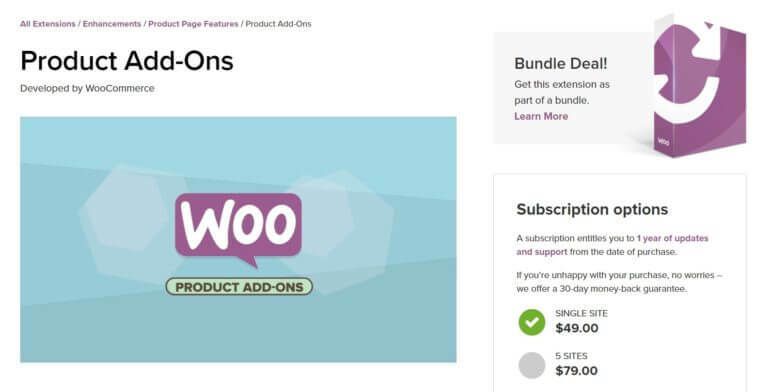 Woo Product Table is 100% integrated with WooCommerce, and is an excellent tool for creating a bulk order form. Try out the WooCommerce Product Table demo for yourself! Display all your products, or create multiple bulk order forms listing a specific selection of products. Present whatever information is most vital for helping visitors make buying decisions. Enable customers to select multiple items and add them to the cart simultaneously. 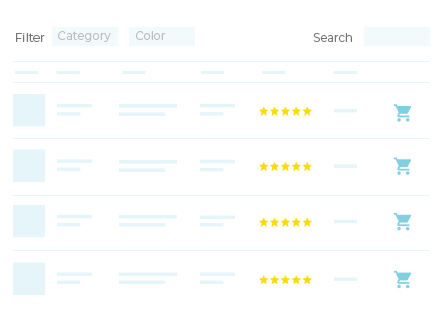 Include searching, sorting, and filtering capabilities in your order form. Let customers choose what quantities and variations they want without leaving the page. Fortunately, this plugin is very easy to use and customize. 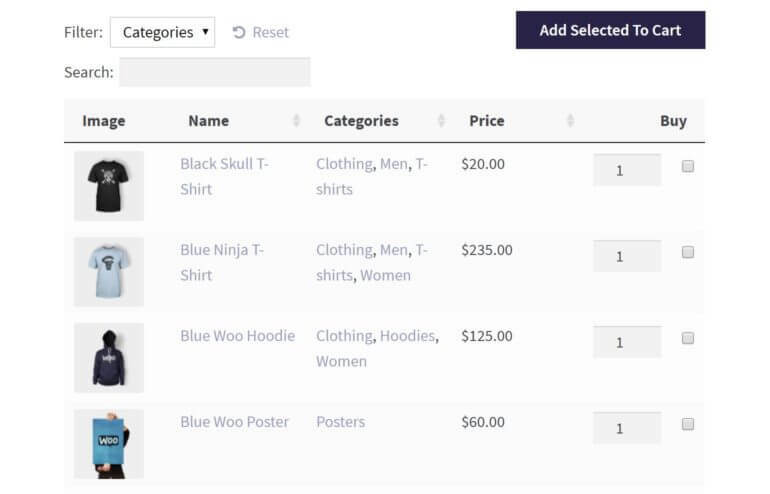 Now, we’ll take a look at how you can use it to set up your own WooCommerce bulk order form. The following steps will walk you through the process of creating and customizing a WC bulk order form. Let’s start with the basics! The first thing you’ll want to do is purchase and install the WooCommerce Product Table plugin. You can do this on an existing or new WP site. Just make sure you have WooCommerce installed, and you’ve added all the products you want to display. Paste in the license key you received when you purchased the plugin. Then select Save changes at the bottom of the page. This is essential for ensuring that all features will work correctly. At this point, you can start customizing your WooCommerce bulk order form. There are a lot of options you can configure. To get you started, we’ll run through a few of the most important settings to consider when setting up a bulk order form. Here, you can determine exactly what information will be displayed in your WooCommerce bulk order form. You can show images, descriptions, categories, and much more. Don’t forget to include an Add to Cart button! By selecting the Quantity selectors checkbox, you enable customers to easily purchase more than one of the same item. Then, in the Add to cart button drop-down menu, choose the Checkbox or Button and checkbox option. This is crucial, since it will let customers check off all the items they want and add them to their cart with one click (using a handy button at the top of the order form). Customers shouldn’t have to visit individual product pages to see all of an item’s variations. Instead, you can display product options (such as colors or sizes) within your Woo bulk order form, either as a dropdown list or on separate lines. 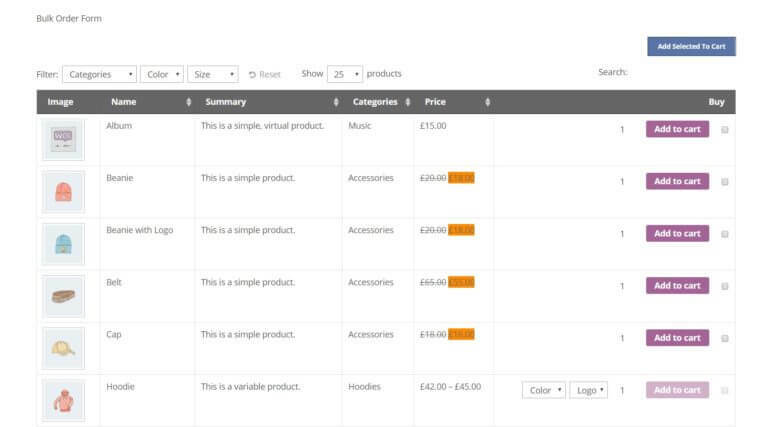 Use the filter options to let customers filter the order form so that it only displays items meeting a certain criteria (such as products in a particular category, if your table contains a category column). If you have hundreds or thousands of products, your bulk order form can take a while to fully load. By selecting this checkbox, you’ll speed up the process so customers don’t have to wait. By default, certain columns in your bulk order form will display as links to the individual product pages. However, you may want to disable some or all of those links. That way, you keep customers on the bulk order form page throughout the entire buying process. When you’re done tweaking the product table settings, don’t forget to save your changes. Then, you’re ready to actually create your bulk order form. If you want to make any additional changes to your WooCommerce bulk order form, go back to the product table settings page and alter whatever you like. Your changes will automatically be applied to your existing order form. By default, all of your WooCommerce products will appear in the bulk order form. You can change this, however, if you want to display particular categories or specific items. This is a good idea if you want to create more than one bulk order form, each listing different WooCommerce products. When your WooCommerce bulk order form is complete, simply Publish the page to make it live on your site! Customers will now be able to use it to make bulk purchases. Before wrapping up, however, let’s look at a few more optional features you can add. In this final step, we want to present a few extra features you can use to enhance your WooCommerce bulk order form. While these options aren’t required, they can be a valuable addition. A WooCommerce bulk order form is a brilliant way to create one-page shopping. But what if you want a way to display more information without taking customers to a separate page? What happens if you have too many variations or product options to fit neatly into the order form? Add quick view buttons or links to the bulk order form. 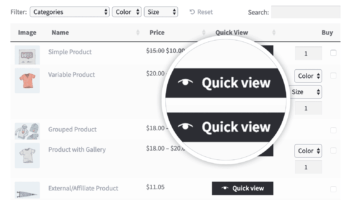 The answer is to use WooCommerce Product Table with its sister plugin, WooCommerce Quick View Pro. This lets customers view extra product information in a popup lightbox window. It’s a great option because customers are not taken to a separate page. When they close the lightbox (either by closing it manually or adding the product to their cart), they remain on the bulk order form. This encourages them to buy more and more from the order form, increasing your average order value. Choose whether to open the quick view by clicking on the product image, name or a dedicated quick view button. Rename the quick view button to anything you like, e.g. ‘Configure’, ‘View More Images’ or ‘Choose Options’. Show or hide the quick view icon. Choose whether to display the product image gallery in the lightbox, and/or product information and purchase details. Choose exactly which product data to include in the lightbox. This extension is simple to use, and gives you more flexibility in what you can let customers buy using your bulk order form. Research into buying psychology has proven that customers buy larger quantities if they believe they’re getting better value. This fits perfectly with a bulk WooCommerce order form. Use your bulk order form with the official WooCommerce Dynamic Pricing plugin. Set up quantity discounts to reward customers for buying in bulk. It’s a great way to increase your revenue from the same number of customers! You can even use a dedicated plugin to skip the cart completely, and move customers directly to the checkout page. Customers who order in bulk are usually busy people, after all. The quicker you can make the buying process, the better their experience will be. If you’re only selling a handful of items, featuring each of them on separate pages makes sense. If you’re moving a lot of products on a daily basis, however, you’ll need a better way to display them. For WooCommerce shop owners, that means using the WooCommerce Product Table plugin to organize all your items into a single bulk order form. Customize your product table settings. Generate your WooCommerce bulk order form. Add ‘extras’ to your order form. Do you have any questions about how to build the perfect WooCommerce bulk order form? Let us know in the comments section below!